Let’s see if The Dog Whisperer’s job has anything else in common with our industry. In the show, Cesar is always called out for help when things look bleak. Before the families reach out to him, they’ve often already tried to fix the problem on their own, and have gotten nowhere. Now they need professional help. 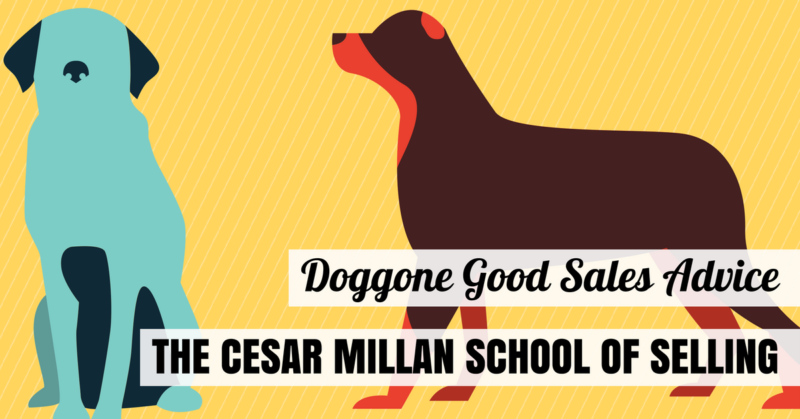 Cesar refers to the most severe behavioral problems he deals with as “red zone” dogs. These are dogs that are so worried and full of anxiety that they shut down any possibility of healthy interactions and often become severely aggressive toward people and/or other dogs. Have you ever had a customer who was so defensive and worried about being “sold” that they were cold, rude, or even aggressive? When a customer is in this state of mind, they’re not able to think clearly or make the right decisions for their families. The amazing thing about Cesar is that he finds a way, even with the most toxic “red zone” dogs, to calm them down, show them that they don’t have to be scared or worried – and turn them back into a more relaxed, normally behaving dog. Now, if you could do that with your defensive, tense customers – that would be a skill that could make a daily difference in your work! As a tech or salesperson in the field, I think you could learn a lot from watching Cesar and observing the calm confidence with which he goes about doing his job. Just like you, every week Cesar is helping his customers (dog owners and their dogs) overcome their greatest challenges by guiding them to discover their true potential. And while his approach is tailored for our canine friends, the more I watch Cesar, the more I find that a great deal of his philosophy applies very well to techs and salespeople in our industry. Like dogs, people push back against force. It’s a natural reaction. The only way for you to become a superstar in this business is by helping your customer discover the right thing to do for themselves. Force pushes people away. Discovery pulls them closer. If you’ve watched the show, you’ve heard Cesar say that a million times: Calm, assertive, state. We all know what calm means, but let’s spend some time on the word assertive. Think of “assertive” as a calm, poised confidence. It is not cocky or aggressive. Being flustered in front of a customer, or nervous, or desperate will get you nowhere fast. When you give off a vibe of confidence and capability, people will tend to go with the flow since you seem so consistent and in control. Leaders lead. They don’t keep their heads down in silence, and they don’t bully or dominate. They lead their customers in the direction of the right decision, help them discover “the right thing” on their own, and support them in their decision. Cesar will occasionally warn dog owners that they’re treating their dog like a human. The problem with that is that they’re not human – they’re dogs. Dog owners need to make dog training about the dog – not about themselves or their feelings. They need to lead their dog in a way that makes sense to dogs, not people. In our business, it’s no different. Your calls are not about you. They’re about your customer, their problem, and their situation. Let them do the majority of the talking and resist talking about yourself and your expertise. Just as a good dog trainer does, a good tech or salesperson needs to spend time on the front end of a call creating an environment of mutual trust. People and dogs alike pull away from those who they don’t trust… they put up barriers. But once trust is established, the two of you can make incredible things happen together. Take the time to build the relationship on the front end, and it will pay off for you and the customer big time on the back end! We’re not talking about disciplining others here. I’m talking about being disciplined with yourself and your process. Cesar teaches his human clients to do the same things in the same ways every time when they’re training their dogs. In your world, this means you need to remain disciplined by sticking to your process, doing a quality job each time, and not shortcutting the system. 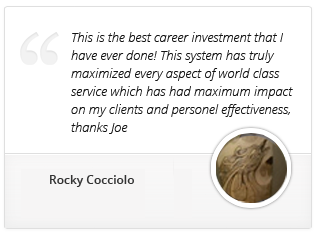 Having a structured sales process like Total Immersion makes consistency much easier. Practice every day. When you lose a job, diagnose why and work on the skills that will save it next time. Have the self-discipline necessary to achieve your greatest potential. Like dogs, you can live in the moment. Dogs don’t care about what happened yesterday. Every day represents a fresh start. Don’t worry things in the past because you can’t control those things anymore. Likewise, if you spend your time thinking about the bad things that you think might happen in your future, then you create a self-fulfilling prophecy which could actually wind up making those things come true. Cesar is in a unique position to help dog owners through even the most serious problems with their pets. You’re in a unique position help your customers through some of the most serious issues that can happen to their home and family by providing higher-quality, longer-term solutions to them that your competition doesn’t have the knowledge or passion to deliver. Cesar’s new show is called “Cesar 911” and airs on Fridays on the National Geographic Channel. You can also see reruns of The Dog Whisperer every Saturday morning on your local CW-affiliated channel. Check it out, and see for yourself how the principles he teaches can help you boost your sales. After all, even an old dog can learn new tricks. If you’re not happy with how your calls have been going, if your average ticket is disappointing and your growth has stalled… we’d like to invite you to our Total Immersion Summit coming up soon. Click here to see the schedule of upcoming summits.